For the brand of cigarettes, see Zhongnanhai (cigarette). Zhongnanhai (Chinese: 中南海; pinyin: Zhōngnánhǎi; literally: 'Middle and Southern Seas') is a former imperial garden in the Imperial City, Beijing, adjacent to the Forbidden City; it serves as the central headquarters for the Communist Party of China and the State Council (Central government) of China. Zhongnanhai houses the office of the General Secretary of the Communist Party of China (paramount leader) and Premier of the People's Republic of China. The term Zhongnanhai is closely linked with the central government and senior Communist Party officials. It is often used as a metonym for the Chinese leadership at large (in the same sense that the term New Delhi refers to the Prime Minister of India and his cabinet). The state leaders, including Xi Jinping, current General Secretary of the Communist Party, and other top CPC and PRC leadership figures carry out many of their day-to-day administrative activities inside the compound, such as meetings with foreign dignitaries. China Central Television frequently shows footage of meetings inside the compound, but limits its coverage largely to views of the interior of buildings. A map of Zhongnanhai from the Republic of China era, with the two lakes shown in green at centre. 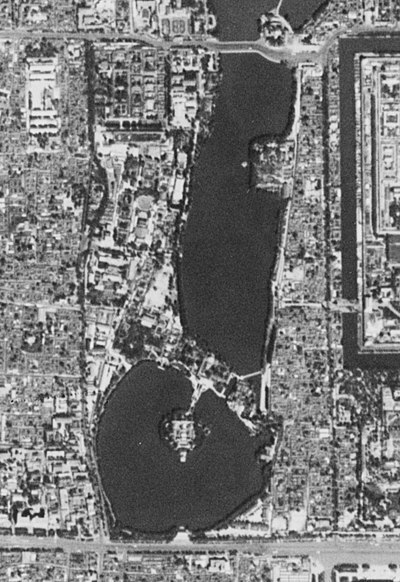 The western edge of the Forbidden City is shown at right. The name of the Zhongnanhai complex, located west of the Forbidden City, means "central and southern seas/lakes", referring to two lakes (the "Central Sea" (中海) and "Southern Sea" (南海)) located within the compound; it is sometimes translated as "Sea Palaces". These two lakes are part of a series of projects carried out during the construction of the nearby Forbidden City. Also part of the same system is the "Northern Sea", or "Beihai" (北海), now a public park.The Northern, Central and Southern Seas are called Taiye Lake (太液池) together. And the "Shichahai" (什剎海) is connected to Beihai at the north. 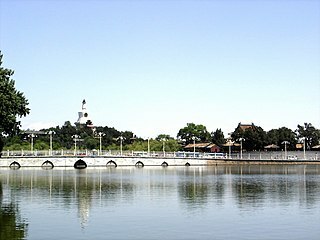 The Taiye Lake were originally an imperial garden called Xiyuan (Western Park,西苑), with parklands on the shores, enclosed by a red wall in the west part of the Imperial City, Beijing. Most of the pavilions, shrines, and temples survive from this period. Whereas the Northern sea had a religious focus, the shores of Central and Southern seas were dotted with a number of palaces. During the Jin dynasty (1115–1235), the Emperor Zhangzong of Jin built the northern lake in 1189. The northern section of Zhongnanhai was the Taiye Lake, with an attached palace called the "Palace of Great Peace" (Daninggong). During the Yuan Dynasty, which lasted from 1271 to 1368, Taiye Lake was included within the Imperial City. It was also expanded, covering approximately the area occupied by the Northern and Central Seas today. Three palaces were built around the lake. After the Ming dynasty moved its capital to Beijing in 1403 by order of the Yongle Emperor, construction on the existing Imperial Palace began in 1406. The Ming palace was to the south of the Yuan dynastic palace. As a result, a new Southern Sea was dug to the south of the old lake. The excavated soil, together with that from construction of the moat, was piled up to form Jingshan, a hill to the north of the Forbidden City. At this time, the three lakes were connected and were collectively called the Taiye Lake. The three lakes were divided by bridges. 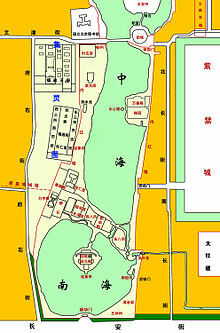 The lakes were part of an extensive royal park called Xiyuan (Western Garden) to the west of the Imperial Palace. 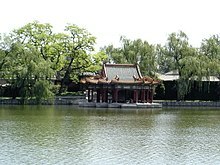 After the Qing dynasty established its capital in Beijing, the government reduced the size of the royal park to within a small walled area around the three lakes. Several successive emperors built pavilions and houses along the lake shores, where they would carry out government duties in the summer. 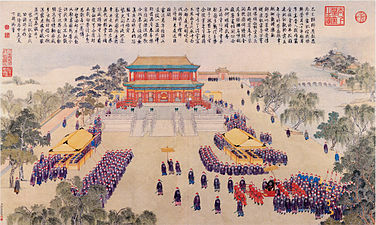 During the reign of the Empress Dowager Cixi, the Empress Dowager and the Emperor would often live in the Zhongnanhai compound, travelling to the Forbidden City only for ceremonial duties. During the Boxer Rebellion of 1899 - 1901, the Russian army occupied Zhongnanhai. Almost all artifacts and decorations in the compound were looted. Later, the Eight-Nation Alliance commander also lived in Zhongnanhai. When Puyi was crowned Emperor, his father as the Prince Regent lived for a short time in the compound. Zhongnanhai attained political significance during the Republic of China era, when the Beiyang Government under Yuan Shikai, placed its presidential palace in the Zhongnanhai compound from 1911. This decision was made because the regime wished to house its government very close to the historical centre of power, the Forbidden City, but could not use the Forbidden City itself because the abdicated Emperor Puyi still lived there. The current main gate, Xinhua Gate or "Gate of New China", was created by Yuan Shikai. The present "gatehouse" was previously a pavilion located on the southern shore the Southern Sea, close to the southern wall. Entry to the compound was instead directly from the Forbidden City. 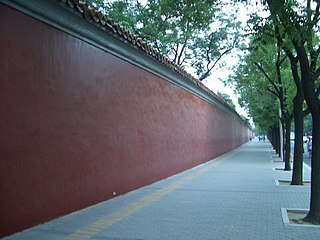 Yuan wished to create a new entrance from Chang'an Avenue, independent of the Forbidden City. Thus the pavilion was modified to become a gatehouse, with nearby walls cut back, resulting in the angled walls near the entrance today. When the Republic of China government moved its capital to Nanjing, the Zhongnanhai compound was opened to the public as a park. Zhongnanhai has served as a government centre again since the early days of the People's Republic of China, founded in 1949. The People's Republic government built many of the structures today seen in the compound. The compound housed the Communist Party of China Central Committee, as well as the State Council. Early leaders, such as Mao Zedong, Zhou Enlai, and Deng Xiaoping lived in the compound. Chinese maps of Beijing show Zhongnanhai as an insignificant green area with a water body; in contrast, the municipal government, however, is shown significantly with a red star. The Empress Dowager Cixi and servants on a boat in Zhonghai in the early 1900s. Procession of Leo Karakhan, Soviet Ambassador to China 1923–26, outside the Xinhua Gate of Zhongnanhai. 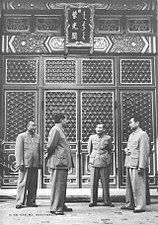 Leaders of the People's Republic, from left, Zhu De, Mao Zedong, Chen Yun and Zhou Enlai outside the Hall of Purple Light (Ziguangge) in 1954. 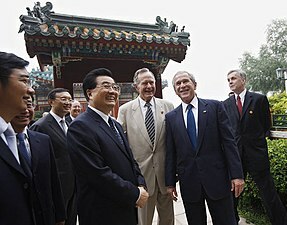 Chinese President Hu Jintao with U.S. President George W. Bush and former U.S. President George H. W. Bush in Zhongnanhai on August 10, 2008. Since Zhongnanhai became the central government compound, it has been mostly inaccessible to the general public. The exception to this was during the years of relative freedom following the end of the Cultural Revolution, when the compound was open to members of the public, who could obtain tickets to visit the compound from relevant government authorities. Following the political turmoil that culminated in the Tiananmen Square protests of 1989, security was greatly increased. Access has now been closed to the general public, with numerous plain clothed military personnel patrolling the area on foot. Cars are not strictly prohibited from stopping on stretches of adjacent roadway. Cabs, for example, are allowed to stop unless during important conferences or events. Zhongnanhai is considered the de jure residence of Politburo Standing Committee members and other senior leaders for electoral purposes. Though it serves as their formal residence, many senior party leaders do not actually live in Zhongnnanhai, preferring to live in homes elsewhere in the city. 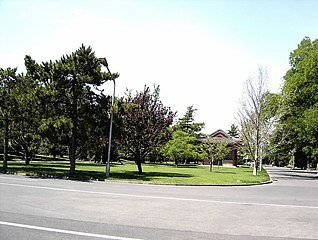 Several more recent leaders, such as then General Secretary and paramount leader Hu Jintao reportedly chose to live in the Jade Spring Hill compound in western Beijing due to overcrowding inside Zhongnanhai. China's current leader Xi Jinping also has a home in Jade Spring Hill. There continues to be no standardized system for awarding certain houses to leaders of a certain rank in Zhongnanhai. After a senior leader's death, their spouse is often permitted to stay in the house indefinitely. Several of these houses were occupied by the families of their original owners into the 1990s. The most important entrance to the compound is the southern one at Xinhuamen (Xinhua Gate, or "Gate of New China"), surrounded by two slogans: "long live the great Communist Party of China" and "long live the invincible Mao Zedong Thought." The view behind the entrance is shielded by a traditional screen wall with the slogan "Serve the People", written in the handwriting of Mao Zedong. The Xinhuamen entrance lies on the north side of West Chang'an Avenue. North Zhongnanhai is the headquarters of the State Council of the People's Republic of China and its affiliate institutions, including the offices of the Premier and the Vice Premiers as well as the State Council General Office. Important guests, both foreign and domestic, are typically received in North Zhongnanhai. (Chinese: 摄政王府) Located in the northwestern corner of Zhongnanhai, the building takes its name from Puyi's regent Zaifeng, Prince Chun who was given the palace in 1909. 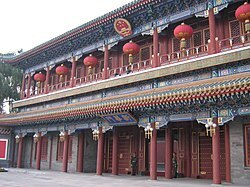 The Building was not completed by the time the Qing Dynasty ended in 1911. Under the Republic of China, the building was initially the location of the Prime Minister's office and the meeting place of the Cabinet. In 1918 President Xu Shichang switched the President's residence and the Prime Minister's office, relocating his residence to Regent Palace, while the Prime Minister and Cabinet moved to Dianxu Hall in Fortress Garden. When Huairen Hall became the Presidential residence in 1923, Regent Palace became the location of the army and naval department. After 1949, the People's Republic of China again used the building as the headquarters of the Premier and State Council. During the massive renovation of Zhongnanhai in the late 1970s, plans were made to modernize Regent palace. However, it was found that the quality of the building was very poor, the foundations were loose and the gaps between the wooden columns were filled with broken brick. As a result, the main hall and entrance halls were torn down and rebuilt completely. The State Council's Conference Room Number Four, which is used for meeting with domestic civil society leaders, was built on the north side of Regent Palace close to West Flower Hall. The main meeting place for the State Council is now next door at State Council Hall. Regent Palace nonetheless continues to be the location of the offices of the Premier and Vice Premiers. (Chinese: 西花厅) Located in the north west corner of Zhongnanhai, this building was constructed as the living quarters for Regent Palace. West Flower Hall served as Premier Zhou Enlai's personal residence. The building also included the Zhou's personal office and meeting rooms. After Zhou's death in 1976 his wife Deng Yingchao lived here until 1990. Unlike much of the State Council area, West Flower Hall was not reconstructed in the 1970s. Today the building is preserved as a museum dedicated to Zhou Enlai. (Chinese: 国务院小礼堂) Originally built as a wing of Regent Palace, State Council Hall is also known as West Hall (Chinese: 西楼大厅) due to its location west of Ziguang Hall. After 1949, a room in the building was converted to be used as a movie theatre which held showings several times a week. The building also included a small cafeteria for State Council staff. In 1979 the movie theatre was removed and replaced with auditorium for the State Council. Premier Zhou Enlai resisted renovation efforts citing a commitment to fiscal austerity. The building now serves as the principle venue for State Council meetings. Both the full State Council and the weekly meetings of the State Council Standing Committee meet in Conference Room Number One. Including its principle conference room, the State Council possesses a total of six meeting rooms which are used for various purposes. The northern section of State Council Hall serves as the headquarters for the State Council General Office. (Chinese: 紫光阁) Located in the northern west bank of the Central Sea, Ziguang Hall is a two-storey pavilion. The Ming Dynasty Jiajing Emperor, built Ziguang Hall as a replacement for Yingtai Island. The building was rebuilt by Qing Dynasty Emperor Kangxi, who would use the location to inspect his bodyguards. During the reign of the Qianlong Emperor the building was used to display battle wall charts and seized weapons. The building was also known as the Hall of Barbarian Tributes and was used to receive tribute missions to the Emperor. After 1949 the building was rebuilt to include a ballroom. A large modern conference area was later built on the building's western side. Ziguang Hall is used today as the main reception area in Zhongnanhai for meeting with foreign diplomats and conducting talks with world leaders. Poolside House was built adjacent to the existing concrete pool that dates from the time of the Republic of China. Because Mao Zedong frequently worked at the nearby indoor pool rather than at his official residence in Fortress Garden, he chose to build a house here in order to be permanently close to the pool. The pool was remodeled and the house constructed under the supervision of Zhongnanhai's engineer Tian Genggui. Mao Zedong moved into the house in 1966 at the beginning of the Cultural Revolution. The building initially had minimal furnishings and no kitchen, requiring food to be delivered by staff. After Mao's death, Zhou Enlai's wife Deng Yingchao briefly lived here before returning to West Flower Hall. The indoor swimming pool was built in 1955 by the Urban Construction and Design Institute. Mao Zedong's wife Jiang Qing reportedly proposed the building's construction during Mao's absence in order to secure its approval. Mao nonetheless used the pool because it was more convenient than traveling to the pool at Tsinghua University. Mao often stayed and worked at the pool for long periods of time. In 1958, Mao met with Soviet General Secretary Nikita Khrushchev at the pool. Today the pool is used by senior party leaders and also contains a workout area. (Chinese: 延庆楼) Yanqing House as well as several other adjoining buildings were built during the Beiyang Government around 1922. Cao Kun used Yanqing House as his workplace while living in nearby Huairen Hall. His wives and concubines lived in several of the adjoining buildings. After Cao Kun was overthrown in 1924, he was imprisoned in Yanqing House for two years. (Chinese: 万善殿) Known in English as Thousand Benevolence Hall, Wan Shan is a Buddhist Temple located in the east coast of the Central Sea. The Temple was built by the Qing Dynasty Shunzhi Emperor for a famous monk that he admired. Statues of the Buddha line the hall. Behind the temple is Thousand Sage Hall, which includes a dome and seven story Pagoda. (Chinese: 水云榭) Located on an island in the Central Sea, the pavilion contains a stele engraved by the Qianlong Emperor reading "Autumn Wind on the Taiye Lake". Taiye Lake is an old name for the all three of the seas. South Zhongnanhai is the headquarters of the Communist Party of China, including the office of the General Secretary and the offices of the staff of the Central Committee General Office. South Zhongnanhai also includes the meeting places for the Politburo, Standing Committee and Secretariat. 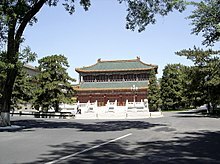 Huairen Hall (Chinese: 怀仁堂; literally: 'Hall of Cherished Compassion') is a two-story Chinese style hall that is used by the Communist Party as the main meeting place for the Politburo and as an alternate meeting place Politburo Standing Committee. The building is also the meeting location of several of the Communist Party's leading groups such as the Financial and Economic Affairs Leading Group and the Leading Group for Comprehensively Deepening Reforms. The building served as the daily workplace of Dowager Empress Cixi, the then de facto ruler of China, replacing the Hall of Mental Cultivation in the nearby Forbidden City. After the Boxer rebellion, Huairen Hall became the headquarters of the occupying Eight Nation Alliance's commander Alfred von Waldersee until the building was damaged in a fire. In 1902 Empress Cixi rebuilt Huairen Hall at a cost of five million taels of silver before ultimately dying here in 1908. After the founding of the Republic of China in 1911, President Yuan Shikai used the building to meet with foreign guests and to accept New Year's day greetings. After Yuan's death, it was the sight of his funeral. When Cao Kun became president, he used Huairen Hall as his residence. After the end of the Beiyang Government Huairen Hall had no permanent use and was given to the Beijing City Government. After the founding of the People's Republic of China, the first plenary session of the Chinese People's Political Consultative Conference was held in Huairen Hall in 1949 and the first session of the National People's Congress was held there as well in 1954. Huairen Hall became the auditorium of the central government, often hosting various art shows and political meetings, including Central Committee plenums before the construction of Jingxi Hotel in 1964. In 1953, the building was remodeled in preparation for the Asia-Pacific Peace Conference by Premier Zhou Enlai. (Chinese: 勤政殿) Qinzheng Hall is the main meeting place of the Secretariat of the Communist Party of China. As the headquarters of the Secretariat, the building houses the office of the party's General Secretary, a title currently synonymous with the paramount leader of the country. The building also includes a conference room that serves as the main meeting place for the Politburo Standing Committee. There is an encrypted hotline that runs from Qinzheng Hall to the White House in Washington, D.C. for the purpose of conducting high level talks with American leaders. The original Qinzheng hall was built by the Kangxi Emperor as the main hall of the Zhongnanhai complex, serving as the Emperor's primary living and working space in Zhongnanhai. After the 1911 revolution, the building served as a venue for government conferences during both the Republic of China and the People's Republic of China. Qinzheng Hall served as the meeting place for the Central People's Government Committee, the interim council that governed China from 1949 until the promulgation of the 1954 Constitution. In the late 1970s, Wang Dongxing, the director of the Central Committee General Office, demolished Qinzheng hall and spent 6.9 million yuan intended for its reconstruction to build his own private residence there. Wang's removal as head of the Central Committee General Office in 1978 prevented him from completing his plan. Qinzheng hall was inaugurated as the Secretariat's headquarters in 1980. (Chinese: 居仁堂) The building was originally a two-story western style palace known as the Hall of the Calm Sea (Haiyantang) during the Qing Dynasty. Dowager Empress Cixi had the building built to entertain her female guests and also to receive foreign diplomats. After the suppression of the Boxer Rebellion, Eight Nation Alliance commander Alfred von Waldersee moved here after Yi Luang Temple was destroyed in a fire. After the founding of the Republic of China the building was renamed the Hall of Benevolence (Jerentang), by Yuan Shikai, who continued to use it to host visitors. 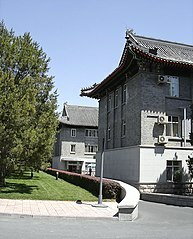 After 1949, the building served as the first headquarters of the Central Military Commission (CMC) before the CMC staff relocated outside of Zhongnanhai. In 1956, the CPC Secretariat became an institution separate from the staff of the Party Chairman and required its own headquarters. The new General Secretary, Deng Xiaoping, chose Benevolence Hall to house the Secretariat. The original building was demolished in 1964 and replaced with a smaller Chinese-style pavilion. The Secretariat offices temporarily moved to "Building C" in the West Building compound before moving to Qinzheng Hall in 1980. (Chinese: 西楼大院) This complex of buildings is named for its location in the south western corner of Zhongnanhai. The buildings were built in the early 1950s to house workplaces and apartments for the Central Committee General Office's staff. In addition to the West Building, the other buildings were designated A, B, C, D and F. Many of the Mishus or secretarial staff assigned to support the General Office work here. As late as the 1990s, West Building Compound included a dormitory for the young workers of the Center Committee General Office. The West Building thus serves as the workplace of the Director of the Central Committee General Office. The West Building includes a large kitchen, a cafeteria for the Zhongnanhai staff and a smaller eating area that doubles as a conference room for the use of senior leadership. The President's office and staff were also located in the West Building during the time when the office of was not also simultaneously held by the paramount leader, such as during Liu Shaoqi's term from 1959-1967. Likewise, Marshal Zhu De's office was located in the West Building when he served as Vice President of China. (Chinese: 丰泽园) These buildings were built by Emperor Kangxi who used them to raise silkworms. The main building in Fortress Garden is Dianxu Hall, which was known as Chong Ya Temple during the Qianlong Emperor's reign, Yiennian Temple during the Guangxu Emperor's reign and as Yitingnian during the Republic of China. During the Beiyang Government of the Republic of China, the office of the President was initially located in Dianxu Hall. In 1918 President Xu Shichang switched the President's residence and the Prime Minister's office, relocating his residence to Regent Palace, while the Prime Minister and Cabinet moved to Dianxu Hall in Fortress Garden. Dianxu Hall became a general purpose meeting area after 1949. Fortress Garden was the site of several other early party leader's houses. Mao Zedong's first residence and office from 1949-1966 were located in Fortress Garden in a building called the Chrysanthemum Library (Chinese: 菊香书屋). Mao relocated to a new building known as the Poolside House in 1966 at the start of the Cultural Revolution. After Mao's death, the Chrysanthemum Library was preserved as a museum which is not accessible to the general public. (Chinese: 淑清院) Located in the northeast corner of the Southern Sea, the building was built for the Qianlong Emperor as part of a small garden, similar in style to the Beihai Park. After 1959, the original building was destroyed in order to make way for the construction of a barracks and officer staff quarters for Unit 8341, the Zhongnanhai security guard regiment. (Chinese: 202别墅) The building next to Huairen Hall was constructed in 1974 as a specially reinforced earthquake shelter. Mao Zedong was relocated here from Poolside House after the July 1976 Tangshan earthquake. Mao died in this building on September 9, 1976. (Chinese: 西四所) These four houses were built as part of the western wing of the Huairen Hall complex. After the end of the Beiyang government these buildings were acquired by the Peking Institute of Historic Research. After 1949 several communist party leaders lived in these buildings including Deng Xiaoping, Li Fuchun, Chen Yi and Tan Zhenlin. During his paramount leadership, Deng Xiaoping used his home as a meeting place for informal conferences that would include members of the Central Advisory Commission, the Politburo, the Secretariat and the party elders. It was in Deng's home that the decision was made to use force against the demonstrators during the 1989 Tiananmen Square Protests. (Chinese: 万字廊) The original buildings in this area were built by the Qianlong Emperor to celebrate his mother's 50th birthday. Today the location is the site of a road through south western Zhongnanhai lined with houses that serve as residences of party leaders. A number of early party leaders such as Liu Shaoqi and Yang Shangkun lived here. Mao's wife Jiang Qing also lived in one of these buildings, known as the Spring Lotus Chamber. (Chinese: 瀛台) Located in the Southern Sea, the artificial island was completed by in 1421 by Ming Emperor Yongle after he relocated his capital to Beijing. The island was given its current name by Qing Emperor Shunzhi in 1655. Yingtai Island is connected with the shore via a stone bridge. Due to the slope of the island, the northern elevation of the island's main temple is a single-story building while the south elevation is a two-story pavilion, called "Penglai Pavilion." There are two temples to the north of Hanyuan Temple, Qingyun Temple to the east and Jingxing Temple to the west. In July 1681 the Qing Emperor Kangxi held the "Yingtai hearings," on the development of a national strategy to put down civil strife. 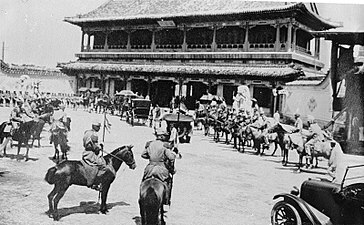 Dowager Empress Cixi imprisoned Emperor Guangxu at Hanyuan Temple on Yingtai in August 1898 after the failure of Hundred Days Reform. Emperor Guangxu was subsequently poisoned and died here in 1908. After 1949 Yingtai was used as the site of banquets and other hospitality activities. According to some sources Jiang Zemin lived in Hanyuan Temple on Yingtai Island during his time as paramount leader. (Chinese: 新华门) Zhongnanhai's main entrance, Xinhua Gate is located on West Chang'an Avenue. The gate was originally built by Emperor Qianlong as a pavilion for one his concubines. After the 1911 Revolution , Yuan Shikai transformed the pavilion into a gate and named it "Xinhua Gate" or "New China Gate". The slogans "Long live the great Chinese Communist Party " and "long live invincible Mao Zedong Thought " are now on the walls on both sides of Xinhua Gate. On the door is the inscription "serve the people" in Mao Zedong's handwriting. ^ a b c d e f g "Zhongnanhai - the Political Center of China". travelchinaguide.com. TravelChinaGuide. Retrieved 7 February 2018. ^ "Zhongnanhai (Central and South Lakes)". china.org.cn. China Internet Information Center. Retrieved 27 February 2018. ^ a b "随历史远去的中南海居仁堂". 随历史远去的中南海居仁堂. Phoenix New Media Limited. Retrieved 8 February 2018. ^ a b "神秘的中南海建筑群". 360doc.com. Beijing six-chi Information Technology Co. Retrieved 8 February 2018. ^ a b c d "毛泽东在中南海的家". 360doc.com. Beijing six-chi Information Technology Co. Retrieved 7 February 2018. ^ a b c Kristof, Nicholas (January 25, 1991). "Columnist". New York Times. Retrieved 7 February 2018. ^ "Chinese leaders vote in local elections". People's Daily Online. people.cn. November 9, 2006. Retrieved 1 March 2018. ^ "罗冰：江泽民抓到胡锦涛甚么把柄". duping.net. The Independent Review. Retrieved 9 February 2018. ^ "Beijing Police Detain Hundreds For Trying to Visit Chinese Leaders Over New Year". Broadcasting Board of Governors. Radio Free Asia. 2015-02-20. Retrieved 1 March 2018. ^ Wang, Dongya. "文汪东亚". NetEase Inc. Retrieved 10 February 2018. ^ Zhen, Jiang. "袁世凯做洪宪梦 冯国璋发卖鱼财变幻大王旗的总统府". xzbu.com. xueshu.com. Retrieved 11 February 2018. ^ "中南海內周總理故居，原只是攝政王府西花園的". kknews.cc. DMCA. Retrieved 8 February 2018. ^ a b "北京国务院有几个会议室？内鬼在哪个会议室？(组图)". wenxuecity.com. wenxuecity.com. 2017-07-04. Retrieved 22 February 2018. ^ "总理吃中餐也要排队 走进神秘的中南海(组图)". wenxuecity.com. 2005-09-01. Retrieved 16 February 2018. ^ "西花厅". Baike.com. Baidu Baike. Retrieved 7 February 2018. ^ "中南海里的建筑也曾遭"拆迁"". sohu.com. Retrieved 7 February 2018. ^ "国务院常务会议照片,国务院常务委员会名单". mxzx123.net. Star Information Network. Retrieved 26 February 2018. ^ "General Office of the State Council". google.com/maps. Google. Retrieved 4 March 2018. ^ "中南海舞会见闻：毛主席跳舞踩不到点". People's Network. people.com.cn. 2011-03-01. Retrieved 12 February 2018. ^ "中南海紫光阁史话". 360doc.com. Beijing six-chi Information Technology Co. Retrieved 8 February 2018. ^ "中南海内修缮工程杂忆". people.com.cn. Retrieved 7 February 2018. ^ "毛主席去世后，一女正国级领导住过他在中南海的房子，还做了一大事". 360doc.com. Retrieved 6 February 2018. ^ "游泳池 卫生间…如何修缮中南海内毛泽东住所". www.people.com.cn. People's Network. Retrieved 7 February 2018. ^ Ok, Tim. "导游图库（122）中南海". blog.sina.com.cn/. SINA Corporation. Retrieved 14 February 2018. ^ "中南海前传（6）烧成灰烬的仪鸾殿". blog.sina.com.cn/. SINA Corporation. Retrieved 14 February 2018. ^ Wang, Jun (15 June 2013). "中央政治局如何开会". qikan.com. Retrieved 18 October 2017. ^ ""怀仁堂政变"后的政治局紧急会议". DWnews.com. Deutsche Welle. Retrieved 5 February 2018. ^ Chen, Zhu Qin (2014-06-19). "习近平主持中央财经领导小组会议，还有谁在座？". Shanghai Oriental Press Co. The Paper. Retrieved 11 February 2018. ^ "全面深化改革领导小组会议部分参会人员名单". eastday.com. 23 January 2014. Retrieved 6 March 2018. ^ "第一屆全國人民代表大會和中華人民共和國憲法的制定". people.com.cn. People's Network. Retrieved 25 February 2018. ^ "中共第八届历次中央全会". gov.cn. gov.cn. Retrieved 25 February 2018. ^ a b "文革后的中南海：中央办事效率最高的时期". LYWZC.com. Comsenz Inc. Retrieved 7 February 2018. .
^ Li, Xiaoqing (2015-06-10). "卓琳以死相逼之前 曾被江泽民一度糊弄". The Epoch Times. Epoch USA, Inc. Retrieved 10 February 2018. ^ "赵紫阳：5月17日决定六四悲剧 李鹏日志：邓小平提戒严令". backchina.com. Overseas Chinese. Retrieved 9 February 2018. ^ 李南央. "鲍彤再看六四（二）：我是如何被抓进秦城的". New York Times. Retrieved 10 December 2018. ^ "解密红色电话："一号机"没有拨号盘和加密按键". Phoenix New Media Limited. ifeng.com. January 13, 2014. Retrieved 9 February 2018. ^ "中南海勤政殿见证特殊友谊". qd8.com.cn. qd8.com.cn. Retrieved 12 February 2018. ^ "中共高官揭汪东兴丑闻：拆中南海勤政殿建豪宅 消息被封杀". aboluowang.com. aboluowang.com. Retrieved 23 February 2018. ^ "1949年10月1日 中央人民政府委员会举行第一次会议". people.com.cn. People's Network. Retrieved 25 February 2018. ^ "Zhongnanhai". GlobalSecurity.org. John Pike. Retrieved 8 February 2018. ^ "readers365.com". 第一篇在爷爷奶奶身边长大. Retrieved 9 February 2018. ^ "中南海里的日常生活". 360doc.com. Beijing six-chi Information Technology Co. Retrieved 7 February 2018. ^ "毛泽东秘书田家英文革被逐出中南海自杀真相". 360doc.com. Beijing six-chi Information Technology Co. Retrieved 13 February 2018. ^ "毛泽东指责哪位高干"荒淫"". qq.com. Tencent. Retrieved 7 February 2018. ^ Tian, Baojun. "建国后朱德元帅的住房：还不如苏联集体农庄主席". Phoenix New Media Limited. ifeng.com. Retrieved 17 February 2018. ^ "乾隆为庆祝其母50大寿，特意建造了这座十分形象的亭子". zhuanlan.zhihu.com. Integrity website demonstration enterprises. Retrieved 8 February 2018. ^ "毛泽东与中南海：人生最后十年在游泳池度过【3】". history.people.com.cn. People's Network. Retrieved 7 February 2018. ^ Terrill, Ross (August 2010). 毛泽东传. Renmin University of China. Retrieved 7 February 2018. ^ "Introduction to Zhongnanhai CP Leadership Compound Schematic Map 02". drben.net. ChinaReport.com. Retrieved 7 February 2018. ^ "苏秉琦的六十年考古人生". mjlsh.usc.cuhk.edu.hk/. Chinese University of Hong Kong. Retrieved 8 February 2018. ^ Zhao, Ziyang (2009). Prisoner of the State. Simon & Schuster. p. 23. Retrieved 8 February 2018. ^ Wang, Shen (2009-11-05). ""四人帮"被捕：江青很平静 王洪文反抗最激烈". Phoenix New Media Limited. Retrieved 8 February 2018. ^ "The Last Week of Mao Zedong". bostonese.com. bostonese.com Online Journal. Retrieved 7 February 2018. ^ SalviNg (2014-11-14). "習近平奧巴馬瀛台談話部分內容首次曝光". WENWEIPO.COM LIMITED. Retrieved 8 February 2018. ^ Lin, Feng (2015-03-23). "江泽民架空胡锦涛的内幕". The Epoch Times. Retrieved 9 February 2018. ^ "金婚纪念日江泽民为何邀请同窗到中南海相聚？". Phoenix New Media Limited. ifeng.com. March 10, 2013. Retrieved 15 February 2018. (in Chinese) China.com.cn - Zhongnanhai with images of Zhongnanhai today.